In our previous article we have discussed the alternative way to get flow statistics using a NetFlow generator. One of the fundamental features of the generator is its capability to export flow records to multiple destinations (NetFlow collectors). 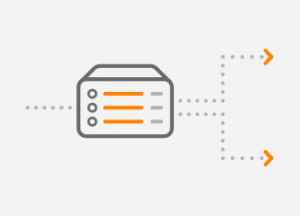 Often, it is necessary to export NetFlow traffic to more than a single NetFlow collector, for instance for production, testing or development purposes. Indeed, many network devices with a built-in NetFlow feature are capable to export flows to multiple destinations as well as most of NetFlow generators. Below is an example of Flexible NetFlow on a Cisco IOS router which is configured to export flow records to two NetFlow collectors – 192.168.3.1 and 192.168.4.1 (Picture 1). However, some network devices do not support the exporting of flow records to multiple locations. In this case, we can use a workaround in the form of a flow samplicator inserted between a NetFlow exporter and collectors. A NetFlow samplicator is a program that receives UDP datagrams on a given port from a single or multiple senders (NetFlow exporters) and resends those datagrams to a specified set of receivers (NetFlow collectors). To demonstrate the function of a NetFlow samplicator, we will replace a flow exporter running Cisco IOS with a VyOS appliance (Picture 2). 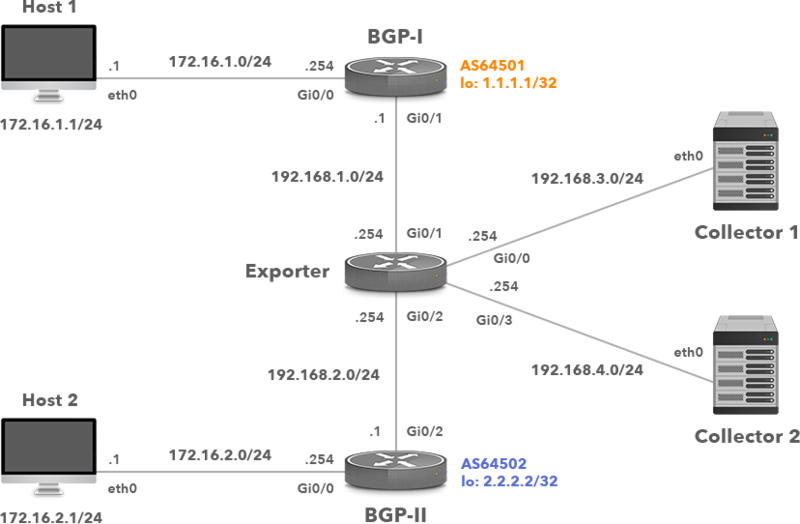 The appliance with the IP address 192.168.3.254/24 is located in the middle of a network topology and is configured to operate as a NetFlow exporter. It does not support flow exporting to multiple locations. 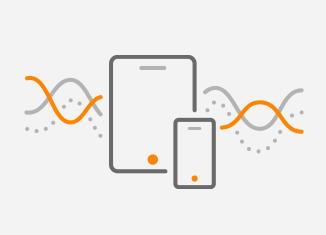 Therefore, the VyOS appliance exports flow records version 9 to the NetFlow samplicator that is listening on the IP address 192.168.3.2 and the UDP port 2055. 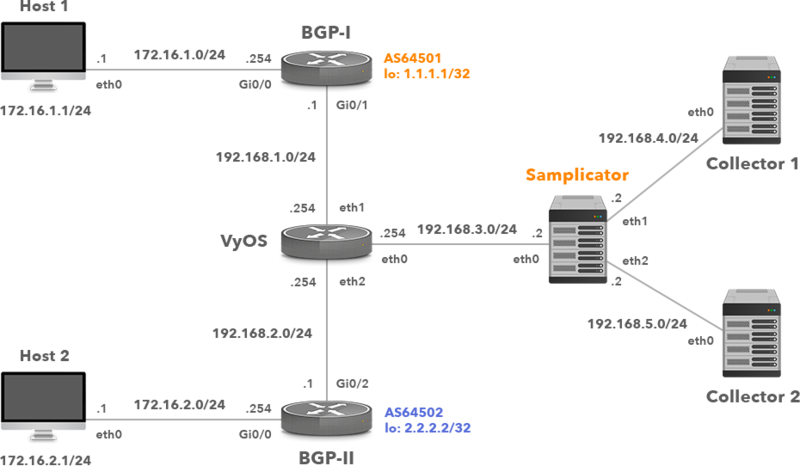 It is a job of the samplicator to redistribute NetFlow traffic (UDP datagrams) to the configured receivers. Below is the configuration related to NetFlow v9 on VyOS. Let’s start NetFlow samplicator and check if it is listening on the socket 192.168.3.2/2055 (Picture 3). -c Specify a config file to read. -f Fork. This option sets samplicate to work as background process. -S Maintain (spoof) source address. -x <delay> Transmission delay in microseconds. Soon after the NetFlow samplicator is started, we should see the debugging messages (Picture 4) in the console. The samplicator resends NetFlow records received from the NetFlow exporter with the IP address 192.168.3.1, the source port 39268 as UDP datagrams to NetFlow collectors 192.168.4.1 and 192.168.5.1, the destination UDP port 2055. 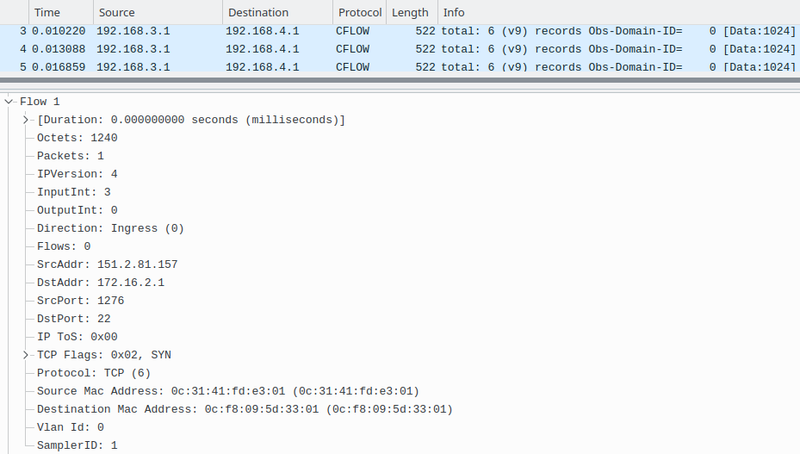 Use Wireshark or tcpdump to open the pcap files captured on both collectors and explore. When we reviewed both captures properly, we could see that flow records contained many flows, counting a single IP packet that has been sent from different source IP addresses to the destination IP address 172.16.2.1 (Picture 5). 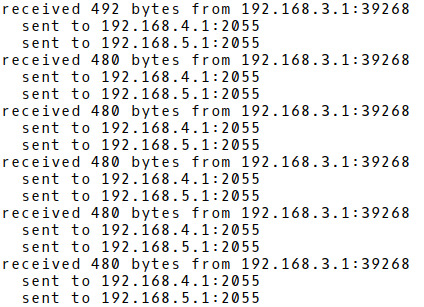 Those are TCP segments with SYN flag set, sent from the spoofed IP address 172.16.1.1/24 in order to prevent legitimate users to access SSH service (TCP port 22), running on the host 172.16.2.1. Notice, the source IP address of NetFlow exporter 192.168.3.1. 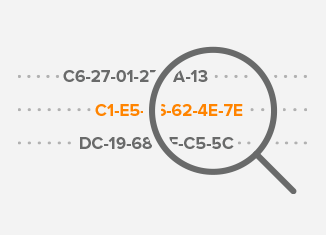 This is the IP address of the VyOS router. As the samplicator is configured with the option -S (spoof source address), it preserves the IP address of the original Netlow exporter (VyOS). Therefore, the IP address configured on the network interface of a UDP samplicator – 192.168.4.2 is not used. Ideally, flow exporters should be able to export flow records to multiple destinations. In reality, many network devices with a built-in NetFlow feature can export them only to a single or at most two flow collectors. Luckily, a hack in the form of a UDP samplicator can be used as a great workaround. Running as a virtual appliance or on physical hardware, samplicators resend UDP streams to multiple receivers. The number of receivers is only limited by hardware resources of the samplicator appliance, such as CPU and RAM. The resources of the built-in NetFlow exporters are also saved and performance kept as they do not need to export to multiple locations. Instead, flow export is off loaded to a dedicated appliance.